You turned 13 months old today! Wow — time is really flying these days! You are so smart and curious, and amaze us by learning new things every day. You are very much into “container play” these days, and you love moving blocks in and out of tupperware, pulling the (baby-proofed) contents of Mommy’s wallet out, and opening and closing drawers and cabinets. You also get a kick out of having us pretend-eat or -drink things; you’ll hold a sippy cup for us to drink, and make a particular clicking/smacking noise. You really like looking at your photo album. Every afternoon we pull it out and point out all your family members, and you’ll occasionally give some of the photos kisses! We’re having some great weather, so you’re also enjoying getting to go the park almost every day. 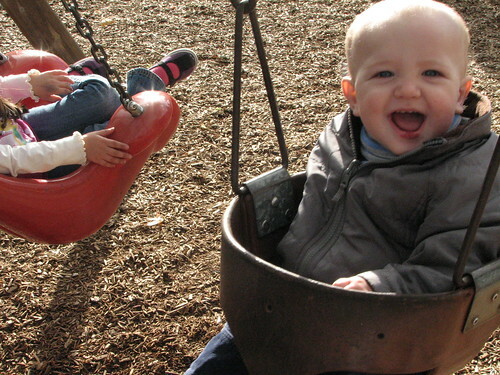 You could take or leave the swing, but love just walking around on the wood chips and leaves, making a pile of wood chips on the slide, and simply being outside. You also like following the bigger kids around, and vice versa! We had an opportunity to give a talk for the adoption agency a few weeks ago, and upon walking into the room of about 20 adults, you headed straight for the center of the circle to show off! You are so confident! Every once in a while you get a bit shy or apprehensive of people you haven’t seen in a while, but warm up within a few minutes. And dogs or people with glasses are a shoo-in every time. Mealtimes are a bit crazy these days. You’re not what we would call picky — you’ll happily eat cabbage, broccoli rabe, and raw spinach! — but are becoming very particular of how you eat. Every meal is a guessing game of whether you will want to feed yourself; want to be fed by us; throw everything on the floor; only want to eat something if it’s a large chunk instead of small bites; etc. We’re trying not to stress too much about it, and remind ourselves of the Division of Responsibility. And you’re still happily growing; at your 12 month checkup you were around 24 pounds and 31 inches! You have been communicating with us for so long now, but are also starting to get the hang of words. You say “Mama,” for Mommy, but you also say it over and over when anyone leaves the room. “Dada” is Daddy, but you say it rarely — usually you call Todd “Mama” too. “Mmm” is “I’m hungry,” or “that tastes good.” “Na-na” or “Bah-bah” are also used around food. You have also said “Aama” a few times –we think this might be Grandma or Grandpa. You sniff when we ask what bunnies do, and can wave bye-bye, know that keys go in doors, and we think we recognize you starting to use the sign for “all done” (which will be especially helpful for mealtimes!). We are very proud parents, but even if you did none of the above, we would still be over the moon about you, Baby Seth. You turned 11 months old on Tuesday! You are within spitting distance of one year old, but in the meantime, we’re enjoying each (fleeting) day of your babyhood. And each day you are learning more and more! Sometime in the last month you seem to have mastered turning board book pages and standing up without pulling up on anything. And more and more, you are learning how to really communicate with us. You can tell us you want to be picked up or held, and when you want to go see something — that something is still usually a light switch, the oven or toaster, or the stereo. You are obsessed with all things glowing or electronic, and could happily play with buttons or switches for hours. Mommy jokes that we should just get you a clock radio and a wet washcloth for Christmas, and you’ll be happy. But thankfully, you’re usually happy anyway. You had a little cold the past two weeks, and it slowed you down slightly, and made you a bit cranky, but you were otherwise not bothered. We also got you a set of real shoes, and you have been practicing walking with them on. With them, we let you roam around the backyard, and you love it. You pick up a wee handful of dirt, or a single leaf, and carry it around while squealing and laughing. You like to practice using a spoon during meals — you can usually pick up the spoon from your tray and get the food successfully into your mouth! We love your sweet voice. You have taken to making an audible “eating” noise, and are getting ever closer to saying words. You say “ma-ma-ma,” but it can refer either to Mama, or when you’re excited to eat. You say “Da!” either to Daddy, or when you see something really neat. We also love cuddling — you can give us kisses, and lay your head on us. Getting in and out of the car seat, and diaper changes (still! ), are a bit hard for you. We’re also still doing a lot of coaxing to get you to sleep. But could anyone else get us to laugh like you do, by dancing, or taking your socks off and licking your big toes? You are so energetic and curious, it’s a challenge to keep up with you sometimes, but we will always love you from your great big brain to your busy toes. Happy 10 month birthday! Sort of… Actually, that was back on October 24th, so we’re closer to your 11th month than your 10th. You are just so active these days, it’s hard for Mom and Dad to find time to write a post. You are a great walker, and that’s definitely your preferred way of exploring the house. As of your 10th month, you were unable to stand up unassisted in the middle of the room, so the only time we saw you crawl any more is when you were making your way to something to pull yourself up on. You walk all over the house now, and love exploring everything you can get to. You’re still obsessed with the kitchen, and the quickest way to make you grumpy is to have Mom or Dad cooking and not lift you up to see what’s going on. It’s been fun watching you play in the nursery at church. Most of the time, you just run around and raise a ruckus, making noise and chewing toys and leaving a wake of chaos behind you. It seems like some of your little friends don’t know what to think of such a wild guy! But they’ll sometimes get up and play next to you – you guys haven’t quite figured out the idea of playing with each other, but you and Theo sometimes play close to each other and I can make both of you laugh at the same time. Mom does a great job of feeding you a wide range of nutritious and interesting foods, from hummus to edamame to nori to swai. You’d probably prefer if we just stuck to chunks of cheese and the sweetest fruit purees we could find, but you’re good at trying everything at least once, and will usually eat a good portion unless you really don’t like it. You hate wearing bibs, and prefer to be shirtless when you eat. Your messy style of eating has increased the number of baths you get, but fortunately, you really love bath time. Every day you just get sweeter and cuter, and you amaze us all the time with how smart you are. We can’t wait to see what you’ll do next! You turned nine months old on Thursday. Time is really flying by, and you are growing up so fast! You took your first step on 9/19, and have taken many more since then. The longest you’ve walked so far is about 4 feet, and you are so sure of your steps — no “drunken sailor” stumbling here. When you’re not practicing your walking, you can crawl lightning-fast, and can nearly run along the couch with the bare minimum of support. You are quite the explorer! You have learned how to open kitchen cabinets, and doorknobs aren’t far behind (once you grow a couple more inches). We enjoy showing you how to turn lights and the ceiling fan on and off. Your absolute favorite thing is watching what goes on in the kitchen. Whenever the toaster oven is on, you need to watch it. When there’s a pot on the stove, you need to check out the contents, and whether we have set the timer. Making dinner has become quite the affair! Diaper changes have settled down a bit, though you still have your moments of refusing to be on your back for them and clothes changes. You dislike having your face wiped after eating, though brushing your teeth afterward is a big highlight. We’ve also learned that we can’t step outside with you and come right back in the house (say, to check the temperature) — if we walk out together, we need to stay out for a walk or a play in the grass. We’re starting to notice you “play” with toys a bit more. Toys still go in your mouth most often, but you really like to make noise with them by shaking them or banging them together, and you enjoy pulling duplo pieces apart or knocking down stacks that we make. Your favorite toys are anything novel and cell phones. You will also sit still for most books, and are starting to get turning pages on your own. I can’t remember when we introduced finger foods, but you love them! Your favorite foods are anything you can pick up and eat yourself (cheese, O cereal, avocado, etc), and any kind of fruit or sweet-tasting veggie. We’re hoping that as we introduce veggies in finger-food form, you will learn to like them too. Happy 3/4-year birthday, baby Seth! You turned eight months old on Monday! That’s two-thirds of a year! Your first tooth broke through your gums on July 29, the hottest day in Seattle on record. You were a bit uncomfortable and cranky, and had trouble sleeping, but who knows whether the heat or tooth pain were more to blame. Your second tooth broke through last week. Boy, are they sharp when they first poke through, as you likely know. You still love to blow raspberries on our arms, but there’s now about a 40% chance that you’ll give us a bite instead. We’re happy taking the risk though, because it’s sooo darling when it’s a raspberry. You are an expert crawler these days! You’ve cooled your interest in trying to stand in favor of exploring. Your Seth-height shelves full of books and toys pale in comparison to what treasures you think the bathroom or bedrooms hold. We’re sorry to say we don’t let you explore those rooms too much, as there are too many cords, shoes, and dust bunnies on the floor (but those are the treasures! says Seth). You can pull yourself up on anything now, including the walls and kitchen cabinets, and you love to “cruise” along the couch and bookshelf. Over at Grandma and Grandpa’s house, you were confronted with two stair steps for the first time, and had no trouble whatsoever climbing up them. Wow! 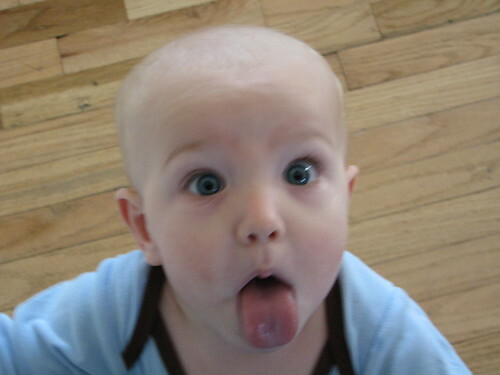 You really enjoy seeing other babies and kids. We were really impressed when we went to to adoption agency’s summer picnic and you “played” with 12 month old Liam without trying to pinch or pull on him. You’re also digging on your new book I Love Colors, especially the photo with a baby wrapped in a yellow feather boa. 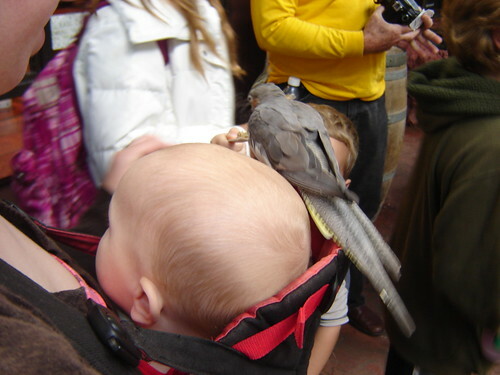 When we went to the zoo, you could care less about the animals (with maybe the exception of the bird, above), but loved seeing all the kids. You’re still eating new foods like a champ, and pretty much use the food spoon by yourself. We fill the spoon with food, hand it to you in the vicinity of your mouth, and you take it from there. 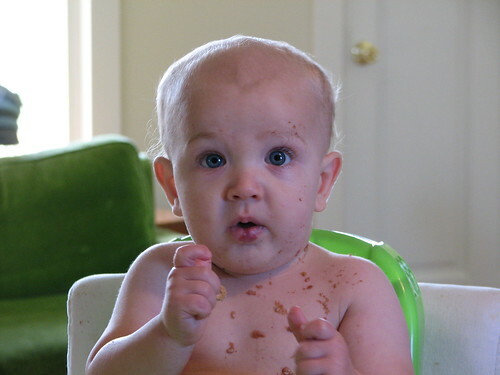 Meals, therefore, are really messy, but we love that you eat with such gusto! Things you didn’t like this month include lying on your back for diaper changes (still! argh! although “five little monkeys jumping on the bed” is a good distraction), being held by one parent when you would rather be held by the other, and going in and out of your car seat. Other than that, you’re one happy camper most of the time. You get cuter and smarter and more grown up every day, and we’re so happy to be your parents. Boy, time is flying by! So much that this Monthiversary is almost a week late! Every day you are learning new things. Six months of age has seen you rock back and forth on all fours, scoot around using your arms and letting your legs drag behind you, and finally working all your limbs in concert to CRAWL! You use your crawling skills to get into all kinds of mischief. If Mommy turns her back for one second, you’re off trying to chew on her shoes or get to all the wires underneath the computer desk, or running away during diaper changes. And now that you have mastered crawling, you’re on to your next goal: standing by yourself! You love to use Mommy, Daddy, the couch, anything really, as a step to pull/push yourself up to standing, and then want to let go and try standing by yourself. At the rate you are catching on to things, we guess you’ll have this down in a few weeks. Besides loving all things active, you love giving Mommy and Daddy raspberries on any body part you can get your mouth on. 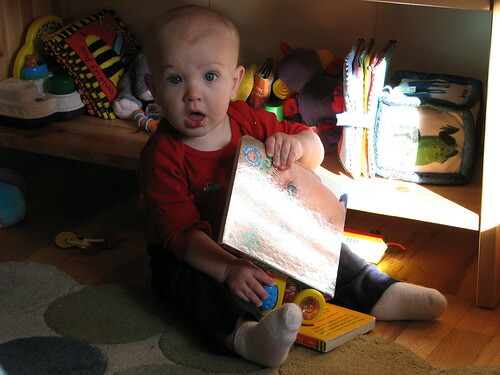 You also love your books featuring babies (Global Babies and Baby Faces) and especially seeing babies and other kids in person. You met Elise (11 days) and Hailey (5 months) for the first time this month, and we had to hold you back from tackling them. Your favorite toys are spoons, the blue rattle that Skyler gave you, and anything you’re playing with for the first time. You’ve been a bit more clingy and fussy, and getting you to sleep is more challenging these days. 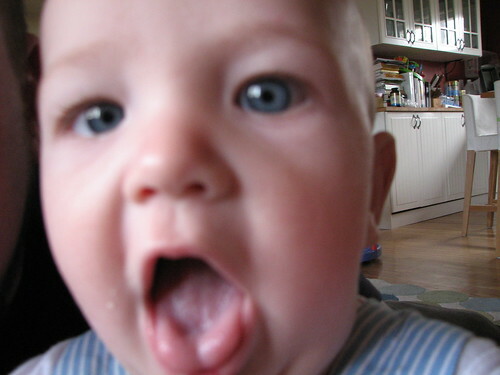 We think teething and all the new skills you’re learning are the main reasons, and hey! we can’t fault you for growing up and growing teeth. You’re good at saying, “nananana…,” which usually means “I’m hungry,” or “I want Mom,” or “Pick me up.” You can also say “dadada” and “bababa” and you like to practice your bilabial fricatives a lot. We haven’t measured your height and weight since last month, but you continue to stay long and lean. Are you going to be a soccer player? Gymnast? Swimmer? We’ll find out soon enough, but for now, we’re enjoying our seven month old bouncy Baby Seth. We can hardly believe you are six months old! But Boy, you are growing and learning new things every day, so we guess it only makes sense. You are becoming more and more mobile every day! You love to roll over, and scoot backwards, and climb up our tummies when we’re holding you…You also are trying to get the hang of crawling; you make yourself into a mountain shape by sticking your bum way up in the air, and push your head into the surface you’re on. As soon as you learn that your head needs to be held up during all of this, you’ll be tearing around like crazy. You really are a happy baby! You smile really easily, and we’ve found a few tricks to hear your wonderful laugh (usually raspberries about the face and neck). You love when Dada comes home in the afternoons, and practically leap out of Mommy’s arms to get at him. You also really like grabbing at EVERYTHING, especially if it’s something you can stuff in your mouth. Watching Mommy brush her teeth, looking at yourself in the mirror, looking at books, bath time, and the ever exciting squealing, talking and bouncing, are also favorite pastimes. You have developed a game in which you wave around a toy or washcloth a few times, then drop it, then we lower you down to pick it up yourself. Then repeat the process a dozen times. We have experimented, and it’s not as fun (for you nor us!) when we pick up the item for you. 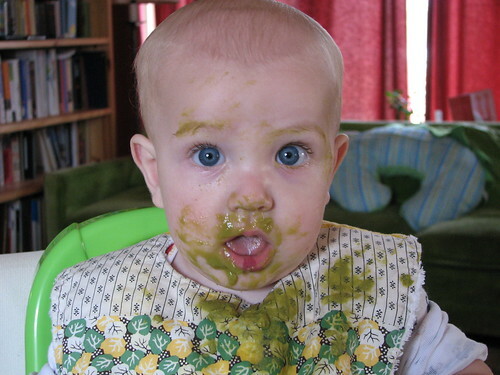 You’re *almost* ready for solid foods, and if the fascination you have watching us eat is any indication, you’re going to be quite the eater. At your six month check up, you were 17 lbs 9 oz and 29 inches. Wow! You’ll be towering over us both in no time! Sadly, you seem to have outgrown being walked to sleep by Dada, but enjoy being sung or nursed to sleep, or lying quietly between us and reading a few books before bedtime. 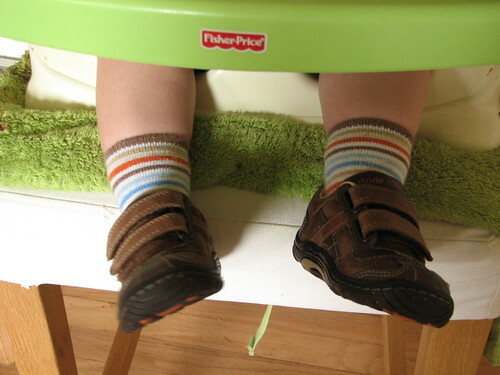 You’re not a big fan of your car seat, and you sometimes get frustrated with not being able to crawl yet. You also occasionally get upset when one of us leaves the room. But on recent family events, and our trip to California (post forthcoming! ), you did really well with crowds, and being held by lots of people — you must know how much you are loved! We are so enjoying watching and helping you grow and explore the world, and are looking forward to what your next six months hold. Happy six monthiversary, Baby Seth! Five months! Can you believe it? The night after we brought you home, we got 3 inches of snow in our front yard… now, Dad is wearing shorts, Mom is getting sunburns, and we’re grilling pizzas in the backyard. You’ve been with our family through two full seasons and we’re about to start a third. We can’t wait to see you playing in the grass and enjoying the beautiful summers in the northwest. You are getting a lot more vocal, always telling us important news such as “ob ob ob ob ob ob ob” and “craaaaaaaaaaaawww!” We haven’t yet figured out what those mean, but they seem to be pretty exciting in your world. Your legs and arms are a constant blur of energy and movement, which is a lot of fun when we want to play with you, but not as much fun when we’re trying to change your diaper or put you into your jammies for sleep time. You’re even a good mover in your sleep – you used to just sleep quietly in between Mom & Dad, but now you are always rotating and shifting and rolling around, and we’ll wake up to find you perpendicular to us, cuddled up right next to one of us, or doing some sleep-flailing of your arms, smacking us in the face as we try to snooze. You still haven’t mastered rolling over, but you can do it successfully about 10% of the time. You’ve been “kissing” us back a lot too – when we swoop in for a smooch, you’ll grab part of our face and press your wide open mouth into our cheeks or necks or ears or whatever you can get a hold of. You’re a lot more aware of the world around you – you’ll respond to music when it’s playing, and we’ve even taken you to a couple of concerts already. You also like paying attention to the TV when Mom & Dad are trying to watch a movie, something we’re not too excited about, as it means we’ll have to start making sure our movies are baby-safe before too long. You are fascinated by watching us eat, and stare at every bite we take. You’ll sit still for a little bit when we try to read a book to you, but I suspect that you just like being held and talked to, and that the book in front of you doesn’t mean a whole lot yet. You definitely like being the center of attention, and while you put up with having other people around, you really want us to devote all of our attention to you. You’ve moved from being obsessed with sucking on things to being obsessed with chewing on them. You’d gnaw on a knuckle for hours on end if we let you. Your favorite toy right now is your monkey, which has a lot of interesting surfaces to chew on, but you also really like your star-shaped chew toy that vibrates when you chomp down. You are still the most wonderful marvelous little boy the world has ever seen, and we are just crazy about you! the eelfang chronicles is powered by	WordPress 3.6 and delivered to you in 0.356 seconds using 39 queries.